Fontevecchia in Naples for submitting Under another volcano. Documentary produced by the newspaper Identity insurgents. After "Blood of a people" dedicated to San Gennaro (2017) and the relationship between the saint, Vesuvius and the people of Naples, Identity insurgents, news organization also engaged in documentary productions, this year moved to Catania. 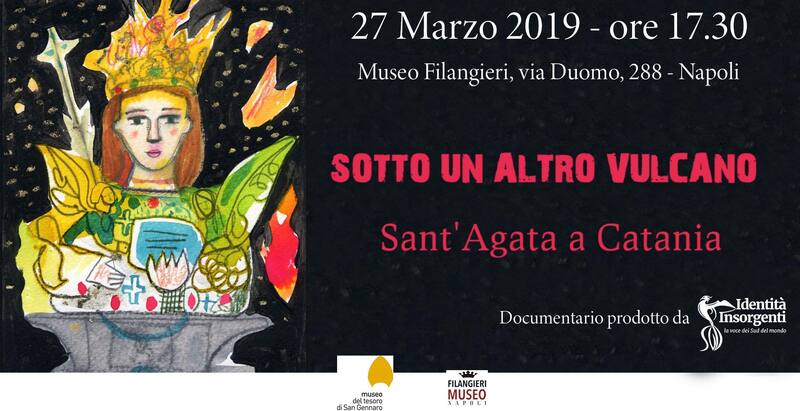 "Under another volcano" it is a documentary filmed in the town of Etna in 2018, in the days when there was the Festa di Sant'Agata. A direct testimony and lived in the city, to understand the reasons for an identity cult so strong and heard from other people living under a volcano, the people of Catania, and that makes it the third most important religious festival in the world, with one million of people who come each year to participate. What makes it so strong this time of devotion? At this the documentary "Under another volcano"Tries to give answers, recounting the days of the festival, and telling Agata Catania and through interviews with religious, archaeologists, art historians. But even craftsmen, artists and performers who are recovering and reprocessing elements of identity. Paolo Iorio director of Museo Civico Gaetano Filangieri and director of Museum of St. Gennaro Treasury. Followed by a screening of the documentary "Under another volcano." Admission is free subject to availability.